Gremlins that have been tasked with controlling the voracious Pigs, How Whisperers know the secrets to keep them in line. The How Whisperer is a decent 5 Soul Stone model and is useful if you are running any Pigs in your list. He is Ht 1 and has the general Gremlin defense and willpower of 4 and 7 wounds. 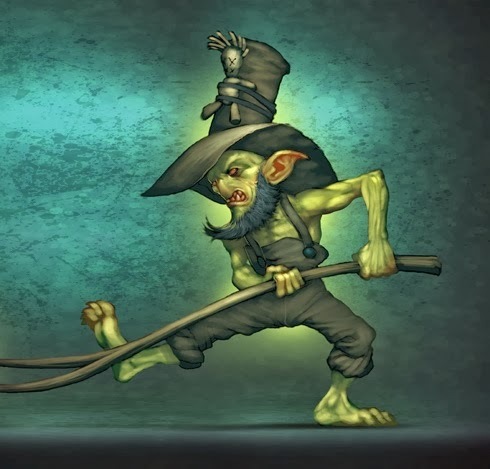 They have the same Gremlin mobility with a 5-inch walk and an 8-inch charge, and like most Gremlins, they can Reckless for an additional AP. They have two great abilities that work with Pigs; they have Pork Whisper’n, which allows friendly Pigs within 8” and Line of Sight to ignore Set’er Off for the duration of their activation. The last ability they have is The Crispiest of Bacon that lets all friendly pigs within 6-inches and Line of Sight to place a scheme marker in base contact with themselves when they are killed or sacrificed. They have a good attack action at Ml 6 with a 2-inch range. The attack only does 1/2/4 damage but they have the Dumb Luck trigger if you get a Ram that changes the damage to 2/4/8. The reason to take these little guys is there two tactical actions. The first one is Stik’m! a Ca of 5 with a TN of 10 Mask, and you can target a pig within 2- inches and give it 3 damage and the Reactivate condition. This combined with Somers aura and a Slop Hauler can allow 3 pigs to reactivate per turn with minimal damage. The second action is Sooey! A Ca 5 TN 10 action that allows all friendly pigs within eight inches to push their Cg directly towards this model. However if you fail the duel to cast it all Pigs in range (8-inches) will immediately charge the Hog Whisperer. The How Whisperer is a must have for any crew that wants to rely heavily on Pigs, (well until the Old Major but we'll get to him later). The Hog Whisperer allowing Pigs to ignore Set er Off for the entire activation allows Pigs to move up and then Truffle the Whisperer closer to keep them under control until you wish to unleash the Bacon Wrath against your opponent.